what happens if the broker runs out of resource (memory/sockets/disk space)? what happens if my clients loose network connectivity? what happens in a power outage ? For performance, you could cache messages, and write them to disk lazily if they haven't been consumed, however the very real downside is that the broker could disappear before the message has been stored. 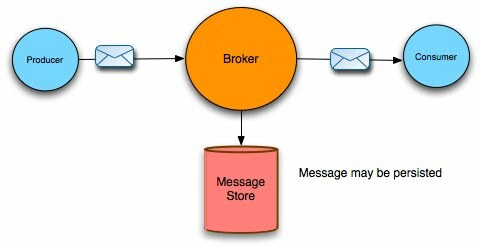 Your application publisher would believe the message was delivered, but this wouldn't actually be true if the broker disappeared. 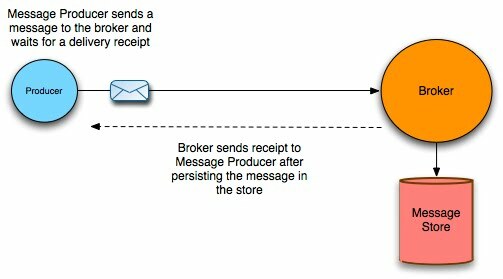 BTW - some people confuse transactions with guaranteed delivery - for messaging, transactions should be used for logically grouping messages together. If you use JMS, never use a transaction to send a single message - its unnecessary. I'm a bit lost. Are you saying that an AMQP broker cannot provide reliable delivery? As you know - AMQP can provide reliability by the use of transactions. I'm not sure why AMQP before 1.0 (and there are no implementations of this yet) didn't support synchronous send. However, most applications don't use transactions, they just assume reliability of messaging - a fair assumption as most messaging systems by default use a synchronous publish to the broker. What's worse is that AMQP has confused transactions with guaranteed delivery - when in fact it should be used to logically group messages together. Thanks for your reply. I appreciate your acknowledgement that AMQP is capable of providing reliability. Indeed this is implemented in both RabbitMQ and Qpid. I don't think AMQP confuses transactions with guaranteed delivery -- it's very explicit that they are groups of actions. And, a synchronous ack does require grouping the publication with the ack. In AMQP 0-8 and 0-9-1 this is achieved by explicitly using a transaction. In AMQP 0-10 there is an additional synchronous publish which is simpler in some cases. If the only thing stopping you implementing AMQP 0-9-1 is that you want to see an explicit, non-transaction scoped, ack on publish, then we invite you to help us define it. We would love to work with you to add it to the spec. The point I was trying to make that by default (and most users just use defaults) - you don't have reliability with out a synchronous publish. Right now we are looking at implementing the AMQP 1.0 spec at some point - along with some other open protocols. "Right now we are looking at implementing the AMQP 1.0 spec at some point - along with some other open protocols." I am trying to archive/store all the JMS messages that pass through ActiveMQ, even after their delivery to consumers. How can I do it? I have tried persistent="true" and also archiveDataLogs="true" but nothing seems to work ! We are trying to store all the messages that are passed through ActiveMQ, even the delivered ones. We have tried persistent="true" and archiveDataLogs="true", but nothings seems to work. Messages are usually always deleted after they have been delivered and acknowledged. However - if you are using KahaDB you can enable archiving which will store deleted messages in a separate directory.